Your doctor has diagnosed you having a macular hole. The retina is the sensing layer of tissue that lines the back of your eye. A specialized are of the retina, called the MACULA, is responsible for clear, detailed vision. The macula normally lies flat against the back of the eye, like film lining the back of a camera. A macular hole is an abnormal opening that forms at the center of the macular over a period of several weeks to months. In the early stages of hole formation, vision becomes blurred and distorted. If the progresses, a blind spot develops in the central vision, similar to the picture you would get if your camera film had a hole in it. Side vision remains normal, and there is no pain. 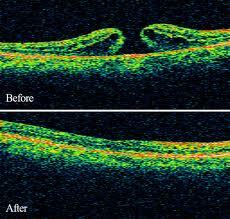 It is uncommon for a macular hole to occur in both eyes. Most macular holes occur in the elderly. The vitreous gel within the eye pulls on the thin tissue of the macula until it tears. The torn area gradually enlarges to form a round hole. Less common causes of macular holes include injury and long term swelling of the macula. No specific medical problems are known to cause macular holes. Your ophthalmologist can diagnose a macular hole by looking inside your eye with special instruments. A photographic test called fluorescein angiogram and another test called an OCT (optical coherence tomogram) may be done in order to determine the extent of the damage to the macula. Vitrectomy surgery is the only treatment that can repair a macular hole and possibly improve vision, as no drops, pills, nor laser is beneficial. Low vision devices may help people manage their daily activities if central vision is damaged in both eyes. Your regular ophthalmologist will refer you to a retina surgeon (an ophthalmologist who has undergone more subspecialized training in retina surgery) to manage your macular hole.